The Polish Jinx: Essie Vending Machines! I wish I loved Essie polish! I find that they are thinner than I like, I find them inconsistent, and overall, I just cant justify the $$ on a polish that I am so underwhelmed by. That being said, man do I wish I loved them! How cool is this?! 100% GUARANTEE that no one tests out the polish you are about to buy. I have seen the Sephora vending machines, and I have seen the Benefit ones, but this is a new one for me! Each Essie vending machine will be stocked with a total of 42 shades from the permanent lineup, along with six seasonal colors that will rotate out every time a new collection launches. 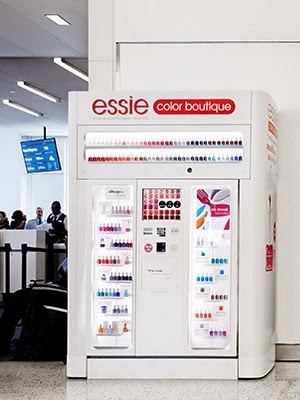 Currently Essie has vending machines at the Jet Blue in JFK (BAH! I am ALWAYS in the United/Air Canada terminal), The Oakland International Airport (not sure when or why I would ever end up there), with Dallas/Fort Worth International Airport, and a few luxury shopping centers in California already scheduled.